This look at heterodox approaches to postmodern technology veers all over the map, leaving little room for informed comments on pertinent subtopics. Logically enough, Davis begins by looking at the impact of both the phonetic alphabet’specifically, its relationship to Christianity—and of the discovery of electricity on modern technology. His definition of “gnostic”in these early chapters seems innovative: Davis is careful to distinguish between the word’s relation to the form of Christianity revealed in the documents found at Nag Hammadi, Egypt, in the late 1940s, and its more general meaning as that which lies outside the mainstream. Yet, at the same time, he emphasizes that a strong link connects both definitions. Davis characterizes their shades-of-gray division as like that between the “soul”and the “spirit.” Along the way, the author also considers important figures on the fringes of mainstream Christianity, notably Pierre Teilhard de Chardin, and their bearing on emerging technologies. Unwisely, he spends a great deal of time discussing movements that are far beyond the pale, such as the Church of Scientology and the suicidal Heaven’s Gate cult. In addition, Davis touches on the ties that bind J.R.R. Tolkien to high-powered computer games such as Doom; on the Year 2000 computer issue; on Masonic conspiracy theories; and much more. As all of this leaves him with little extra space, he (ironically) doesn—t engage enough with postmodern technology itself. 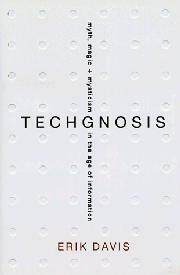 In the concluding chapter, which provides an intriguing yet unmapped connection between an ancient Buddhist myth of Indra’s net and today’s World Wide Web before lapsing into a preachy epilogue, Davis writes, “Tough-minded readers may find this interdependent vision of mystic materialism a bit of a stretch .‘’ Unfortunately for him, the same is also true of most of his work. He would have done well to have taken any chapter of Techgnosis and developed a book from it. Instead, here’s a challenging mishmash.